That’s the lake beyond the tree. It is snow-covered which means it is ice-covered and then snow-covered. The birds have gone elsewhere I guess because there is not a goose, duck or swan to be found. The synthetic track that everyone calls the red carpet is buried in the snow in front of the tree in the picture. The serious runners are still in the park but having to use the black top. Props to them. If it would just get back up to a sustained 30 degrees I’d get back to my walking. After tomorrows snow threat we may actually see a warming trend! Who’d of thought that Sochi would be warmer. LOL! Well there is a bit of good news, I took the picture at 5:18 pm and it wasn’t dark!!! Spring I know you’re out there! 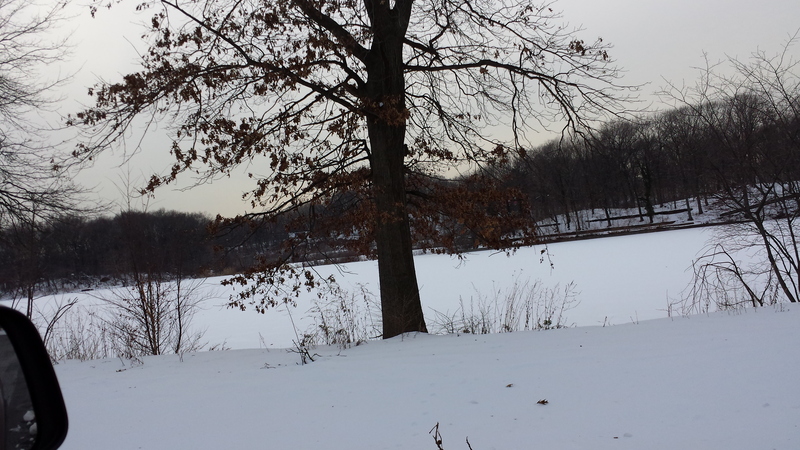 Posted on February 14, 2014, in Thoughts and tagged blacktop, ducks, geese, Sochi, swans, Weequahic Park lake. Bookmark the permalink. Leave a comment.